We know that our main characters (Arika, Nina and Mashiro) have the same birthdays, ergo same age (around 14 or 15). But what leaves puzzled is the age of all other Otome characters. For instance, how old would the Five Columns would be in the Mai-Otome series? I know that Shizuru is older than Natsuki by a year, and Natsuki is older by a year to Sara Gallagher. But what about Mahya Blythe? Is she older or younger than our beloved Shizuru? And what of Sergay, is he like in his late twenties? Would he be put in the same age as Natsuki and Mai (see MO Omake 8 )? Enlighten me, please. Because I have a little project in mind, and the age matters a lot in this. Well. Sergay could be possibly be in his late twenties. He might have been in his early teens (maybe 13 or 14) during the attack at the palace in Windbloom. So that means it makes him 27 or 28. That's my theory regarding Sergay. As for Mai and Natsuki, they may be younger than Sergay, though. I'm not sure. Posting from school here, so I can't stay long. But in topic, I've always had this headcanon of mine regarding the ages. Akane, Nao, Chie, Shiho = 18/19? Ugh can't remember if I miss anyone else. I agree with Franz that Sergay would have been around his early teen during the attack on windbloom so he'd be in his late 20's during Otome. 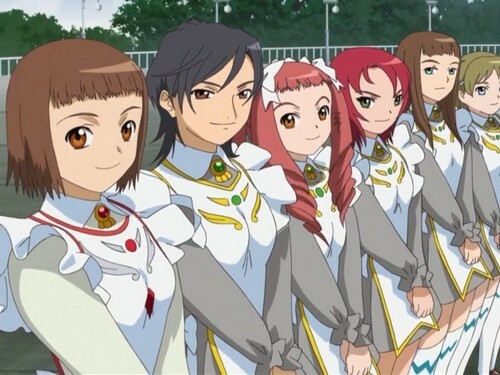 And for the girls, I can't remember why but I've always thought as Mai and Natsuki to be 2 years below Shizuru and Haruka's. Maybe it's because of Hime's influence but it sounds like a good age-gap to me. And I've always thought of Garderobe having a system like a regular western high school (4 years? ), but the students attending the lower two years are called Coral, and the upper two are called Pearl-- hence two years gap between Shiz and Nat. Sara is a cute kohai and she seems close to Mai and Nat-- so one year gap sounds reasonable uh huh. Maya otoh, has this super onee-sama aura in her, and with how she blasts around with every entrance and no one was complaining about it (cept for Akane) I'd like to think that her seniority over the other otome has something to do with it. And for Akane,Nao,Chie,Shiho's age -- I'd like to think they'd be in their last year, with Akane's 'graduation' was her becoming Kazuya's otome and all, and it seems reasonable to think that Nao would be lazing around at school as much as she could so that she won't graduate and become someone's otome takingtheshimagangtoruletheworldsoundslikeagoodreasontoo. Ugh can't remember anything else. will add more once i get home. When we see Sergay in the begining of Otome (or in flashbacks) he appears about Arika's age, thus by doubling Arika's age we get the age range between 28 - 30. Hey Nymph, if you are able to scrounge that source here, that'd be fantastic. 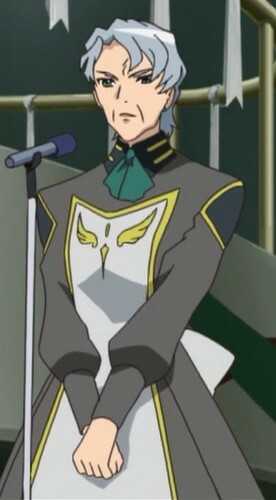 Also, what do you think Sifr Fran's age was at the time of Mai-Otome 0? I've thought of her as 14 or 15-ish. And what of Bruce? Sorry if I'm quite demanding, it's really important for me to get some rough (but good) age estimates of many Otome characters. If I don't, I think I'll screw my pet project up. I don't know if scans of the Mai-Otome art books still float out there or not, but I am in the process of purchasing them. If anything contains information on ages, they are a good place to start. Everything else is pure speculation (Arika, Nina and Mashiro aside). 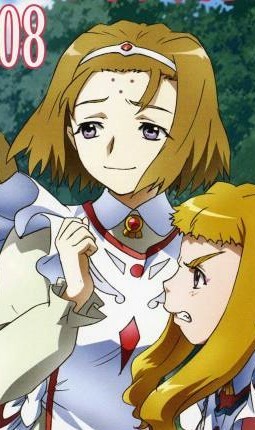 Natsuki Kruger and Shizuru Viola for example are most certainly older than their HiME counterparts. Just took a good look at their character design, there's a bit more maturity there. Early 20s is my guess for those two lovelies. Same goes for Natsuki's entire Coral class at the time, reincarnated Mai Tokiha included. I could now fully confirm Nymph's guesses. I actually checked the Mai-Otome's official web... But I was only able to find ages for the Otome prequel. I also recall something about this. I believe it's related to the reference in episode 9 (20:15) when Irina states that it's been four years since the last wall-cleaning punishment. Imagining that the recipients were Natsuki & Mai, they would be 18-19, with Shizuru & Haruka being 19-20. As part of my usual habit of obsessing over minor details, I've been thinking about the age of Fiar Grosse. In particular, I suspect she may be some years older than almost all of the other Otome shown in the anime. My basis? Dress uniforms. 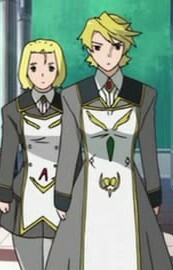 Note that, in addition to the usual dual wings device which appears on a Meister dress uniform, Fiar also has a kite beneath. 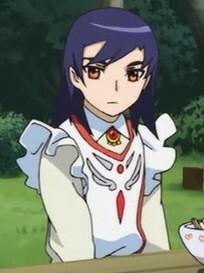 Please correct me if I'm wrong, but the only other Otome whose dress uniform contains this device is Miss Maria. Here's one from my new album, so, if you need a toilet break, now's the time. Given this, I suspect that the kite is granted in recognition of long service as an Otome. 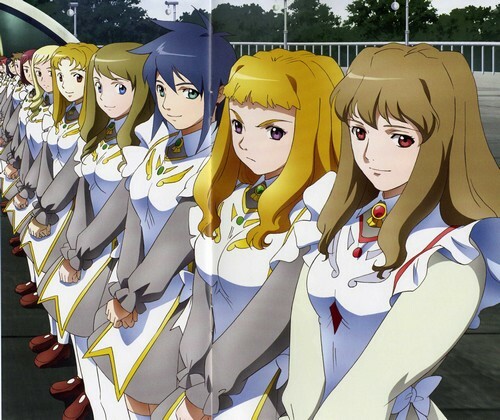 As Maria's is green in Sifr (after 23 years as a Meister), whilst the older Maria has another device crowning it all, I would suspect that Fiar's commemorates her completing a certain time span, say 10 years, as an Otome, making her somewhere in the region of her late twenties or early thirties. 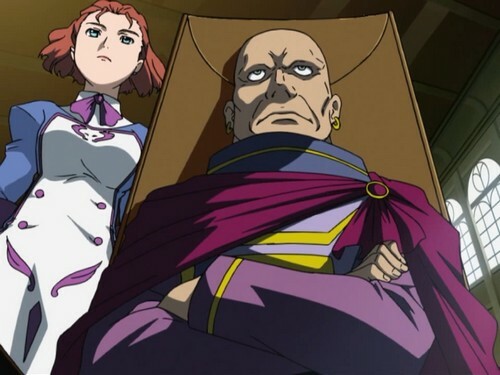 Also, I don't know why I crack up when you mentioned "featuring a characteristically-grumpy-looking number 2," hahahaha! Thanks for the feedback Ruby. It's just one of those happy things I picked up on randomly and thought that it might be worth adding to this thread. I look forward to your PM! It's hard to say, but we could assume she is currently (more like "technically" in non-REM years ) 24 or older (with her final appearance in Zwei) like she was in Mai-HiME.